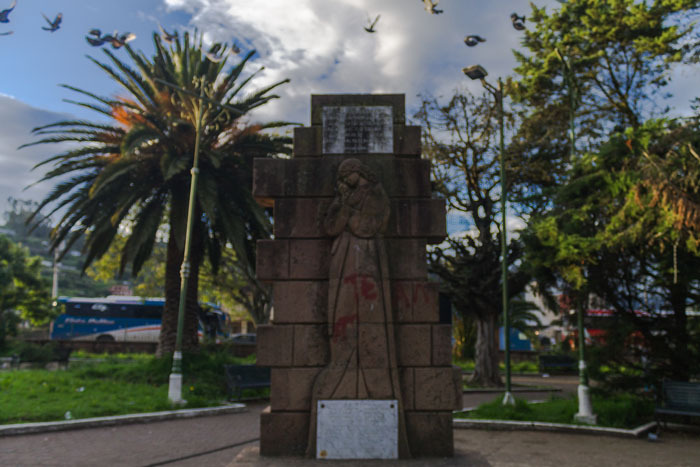 So go the words of Mariana de Jesus, patron saint of Ecuador’s capital Quito, immortalized for flagellating herself to keep away earthquakes. The saint has the haunting ability to appear in any corner of Quito. Her soft eyes keep guard over the most unexpected street corners, regularly hang below the rear-view mirrors of taxis and rest in the country’s most decadent and iconic church. Ecuador is a country intimate with disaster. A 7.8-magnitude earthquake shattered its coast last year, but it has known many more. Fourteen of its volcanoes are active, landslides are annual and the country lies directly on the ring of fire and in the path of El Niño, the climate cycle that brings extreme floods and droughts. The eruption of its supervolcano Chalupas, whose impact scientists compare to the landing of a large a meteor, could alter the planet’s climate. Ecuadorians, though, act as if they live in the eye of the storm. It’s not uncommon to find a settlement that taunts tsunamis, landslides, or tectonic plates to devour them whole. 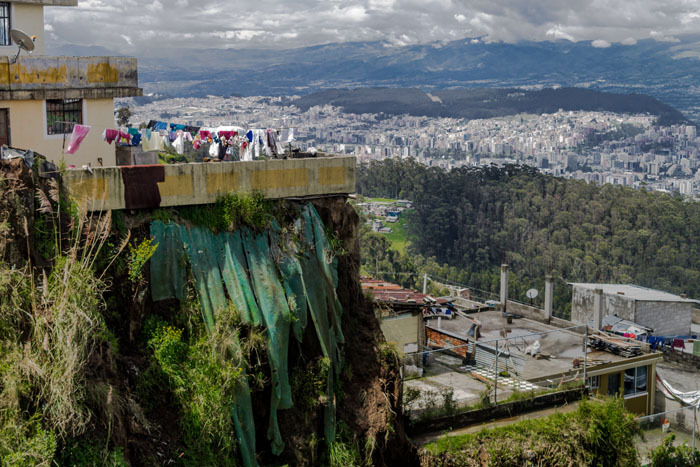 Few dismiss the threat more than the residents of Pelileo, whose center is split by an active fault line known as the first-order “Guayaquil-Caracas megashear,” which can tremble over 100 kilometers on either side, reach one kilometer of thickness and dip ten kilometers deep. Until the next earthquake, Pelileo faces falling ash from the ever-erupting Tungurahua and probable landslides and forest fires. “We’re only waiting for death to come,” says young Pelileo native Fernando Cepeda, half joking. His wife, Raquel Andrade, admits she’s scared, though she rarely thinks about it. Fernando’s childhood friend, Sebastian Torres, had told them he heard another earthquake should be on its way, since eighty years will soon have passed since the last one. In 1949, Pelileo was the epicenter of an earthquake that knocked down every building in town and, so go official records, killed 90 percent of its population. Accounts at the time refer to a “tragedy,” not a natural disaster. Torres’s grandmother remembers a sunny day, when suddenly she saw pigeons flutter and dance. A rainstorm rolled in, a black sky and, some say, lights or an Ecuadorian flag emerged in the wind. Mother Earth—or God, depending on the storyteller—opened her mouth wide to swallow victims and spit them back out. 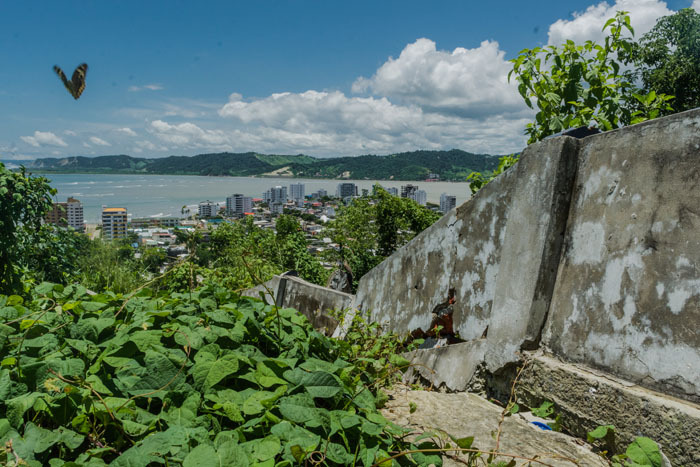 When the famed architect and later president Sixto Duran Ballen came to redesign the town, he found half of it submerged by a landslide, the river changed course and a new pond formed by water spouts contained underground. The few hundred survivors insisted that the plans be made on the same site, on top of the remains of their families, but a squad of international geographers helped Duran Ballen settle on a spot three kilometers closer to solid ground. The new town became Pelileo Nuevo, and the old one—soon dotted with its own unauthorized constructions—Pelileo Viejo. Over time, it became referred to as Pelileo Grande, “perhaps for its grandeur,” says Carlos Miranda, the only local historian that has dedicated his career to Pelileo’s past. Miranda, a serious and bespectacled man, has claimed a near monopoly on the earthquake’s history, and his mother is among the most referenced survivors. 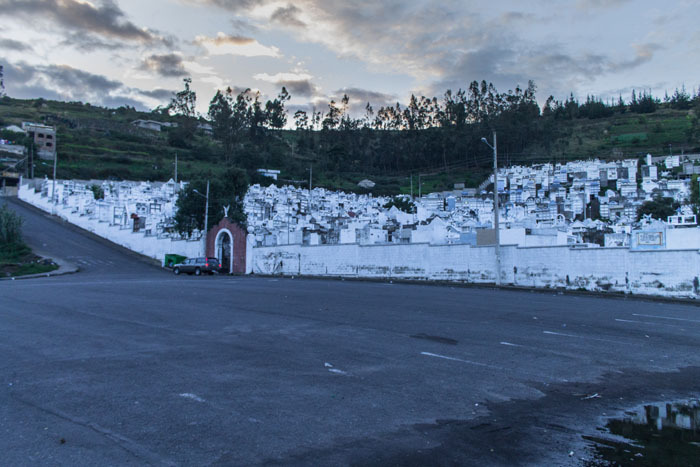 Miranda’s idea of grandeur is unorthodox: Pelileo Grande is very grey and very quiet, walled by a cemetery to its north and the volcano Tungurahua to its south. Small factories produce bus upholstery and dairy products but could never rival industry in Pelileo Nuevo, Ecuador’s jean manufacturing capital. 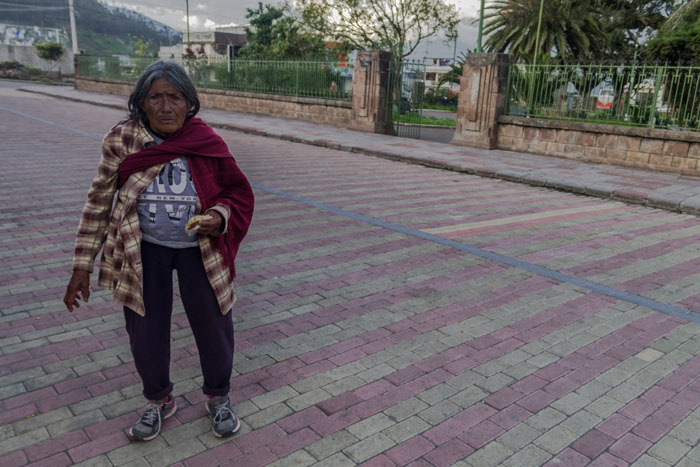 Its near-identical streets, gridded along the cardinal directions, recycle varying assortments of blasting cumbia radio, smoke of burning trash, bored livestock, piles of empty whisky bottles, flower vendors in indigenous dress, and guard dogs in wait. What was a mass grave is now the central plaza, where a family of pigeons ambulates, restricted to the park’s parameters. Maria Telvina Carasco, a wrinkled women loitering by the lone memorial of a grieving mother, asks for bread. She says that she was three when the earthquake struck. Then, she lived on the outskirts. Now, she lives facing the plaza. She isn’t bothered to watch over the victims, some of them relatives she was too young to remember. Carasco shuffles over to the church at the far end of the park where a display of photos and historical descriptions try to resuscitate the memory of 1949. The only remaining chunk of the original church lies behind the display; the other pieces were snuck into backyards and slipped into quickly mounted walls. On every anniversary of the earthquake the bishop of Ambato, the nearest city, leads a procession connecting the churches in Pelileo Nuevo and Pelileo Grande with tributes, prayers and a student march. To Gerardo Merino, a filmmaker from Ambato, the commemoration is more fanfare for the church than homage for the victims. “There’s no real process of reflection and remembering,” says Merino, who completed a documentary project on the earthquake that was exhibited in 2013 and now collects dust on his shelf. Schools don’t teach local history and politicians gloss over disaster preparedness as a token issue, so everything Merino knew about the earthquake before his personal investigation came from his grandmother. To explain how Pelileo Grande really emerged from the ashes, he arranges post-it packs on a piece of paper like a chessboard. The moneyed class lived in the center, and the poor farmed in the highlands, he says. Merino jerks the paper, and all the houses tumble. The well-off who didn’t die in their houses take off to the city, because they can. He reshuffles the board. The peasants, who were safe in their fields, crowd the devalued center. Blanca Malusin Cando of Pelileo doesn’t remember the earthquake—she was two—but she was left with a bad leg and her parents’ stories. Her father hunted for food in the rubble, he would later tell her, and came back with more worms than other nutrition. 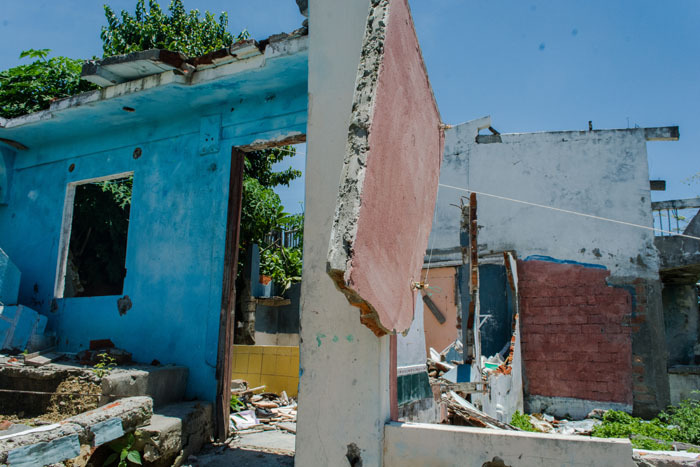 Neither hunger nor trauma drove the family away; Blanca lives in between the mass grave and the cemetery, and her elderly mother a few doors down. They had no other option, Blanca says, and didn’t want to lose the little property they owned. She admits she’s more preoccupied about her diabetes than another disaster. Still, any faint tremor sends her shrieking and kneeling for mercy. Pelileo natives tend to stay in Pelileo, and those who come, come from nearby or for factory jobs. Many still don’t have the means to move to more stable ground, but not all. 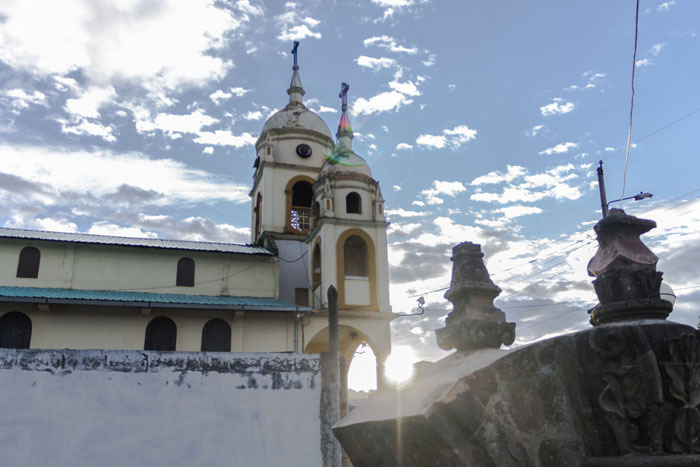 Miranda, the historian, says that people in Pelileo Grande don’t leave because of “a true love for their land”—something typically Pelileño, and more generally, Ecuadorian. Estefania Parra, a sociologist from Ambato who studied its people-led reconstruction after 1949, hypothesizes there’s a bit of pride mixed in, too. Ambateños have a stronger association with their city than Pelileños, but the whole area is known nationally for its work ethic and insistence on self-sufficiency. For generations before 1949, Pelileños faced the same questions and shared the land with the same ghosts. The first-known people to settle in the area were of five different pre-Incan tribes. “We’ve suffered ever since,” says Miranda. The natives worshipped several gods of the natural world, including earthquakes, and the Incas, the final pre-Hispanic civilization, said that their creation deity Pachamama caused earthquakes when she walked. Local mythology also tells of the battle between Ecuador’s most massive volcanoes for the heart of Pelileo’s miss Tungurahua, who settled on the tallest one, Chimborazo, which is considered the ancestor of its indigenous residents. Chimborazo would erupt of jealousy over Tungurahua, who spit ash back when he couldn’t provide her with a baby. Often, disasters were also seen as earthly punishment for upsetting the deities. 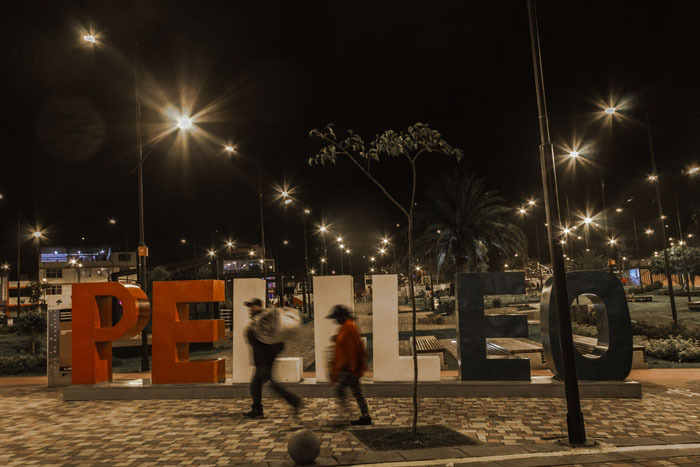 The township of Pelileo was founded nine years after the Spanish set foot in Ecuador. The Catholic Church repressed pagan worship, but when the 1798 earthquake struck, Catholics beatified the Lord of the Earthquake as the patron saint of Patate, a sister town of Pelileo. A yearly festival commemorating the saint still draws devotees from across the region and is in the process of being declared national cultural patrimony. Until the Ecuadorian state created the civil defense force in 1960, the threat of earthquake and eruption was unchecked and relief was ad-hoc. Then, with a series of constitutional changes in 2008, Ecuador became the first country to guarantee protection from natural disaster as a constitutional right. This right, like any, comes with responsibility. Pablo Murillo, who oversees Pelileo for the Ministry of Disaster Management, says that the decision to confront danger is like the decision to drive drunk: the state can enforce laws in the name of public safety, but ultimately, citizens must opt to self-protect. “Every person decides how to live,” he repeats, after mumbling, “Every person decides how to die.” Murillo, who coordinates Ecuador’s most active zone, with two active volcanoes and twenty-four fault lines, has memorized the dollars and lives saved to disaster preparedness since the ministry was established. Both numbers are high. 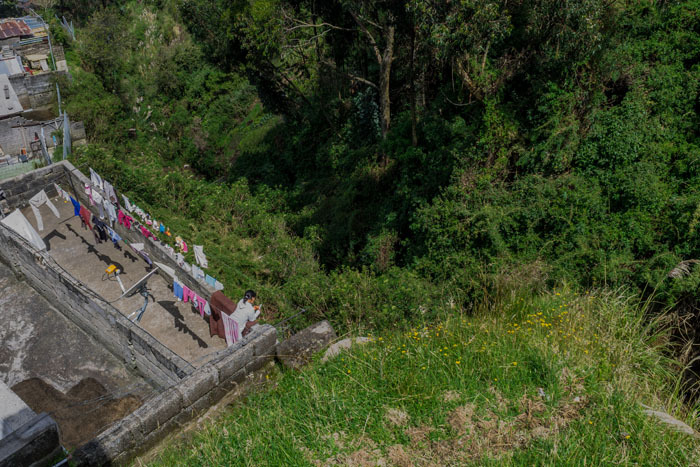 Still, while the ministry covering the Tungurahua area has relocated over 1,000 families to more secure government housing, many of the remaining 200,000 families refuse to budge from gorges and gelatinous land like Pelileo Grande. Murillo recounts the story of two townlets near Pelileo, which took him nearly ten years of work to convince residents to move. Only one of the two successfully made the move, after a landslide disappeared a family’s house. Merino, the documentary maker who infused his rotating exhibit with discussions on disaster preparedness, says that local representatives of the Ministry of Disaster Management favor “what’s close and imminent”—that is, they plan for volcano eruptions rather than earthquakes. But even the threat of Tungurahua, which continuously spits ash, is soon enough forgotten. Cepeda tells Torres, his policeman friend, that he still remembers the first volcano eruption he experienced as a child, but that the rest blur in his memory. Now, he doesn’t flinch when he feels the earth shake. You get used to it, he says. Conversation shifts to the topic of last April’s earthquake. Torres’s mother says she felt she nearly died. Sebastian consoles her that the newly remodeled earthquake-resistant house will be a “Noah’s arc” in the ravished town. Cepeda adds that people now at least understand what an earthquake is. Back in 1949, as the story is told, people laid down in the form of a cross so that that Mother Earth-God would spare them. “And they still died,” comes the punchline. Everyone chuckles. But any humor is quickly erased. Torres notes that Pelileo’s fault line is the kind that opens rather than rubs or collides, so they wouldn’t even have the chance to lay down; anyone nearby would surely be killed. The room goes silent. The gap created by the fault line, covered by leaves. Remains of a house in La Cruz. 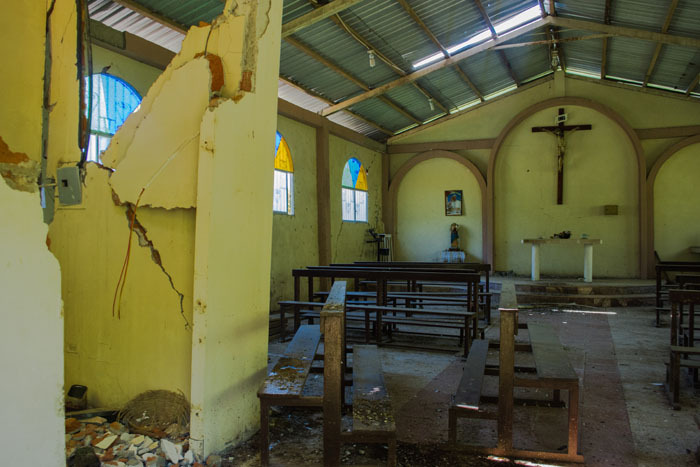 A chapel cracked and overrun by pigeons after the earthquake. Maria Telvina Carasco, earthquake survivor. She was three years old when it hit. The new church of Pelileo Grande next to the remains of the old church. Monument commemorating the victims, in the middle of Pelileo Grande's park, built on top of a mass grave and over the fault line. Pelileo Nuevo, close to where Fernando and Sebastian live. 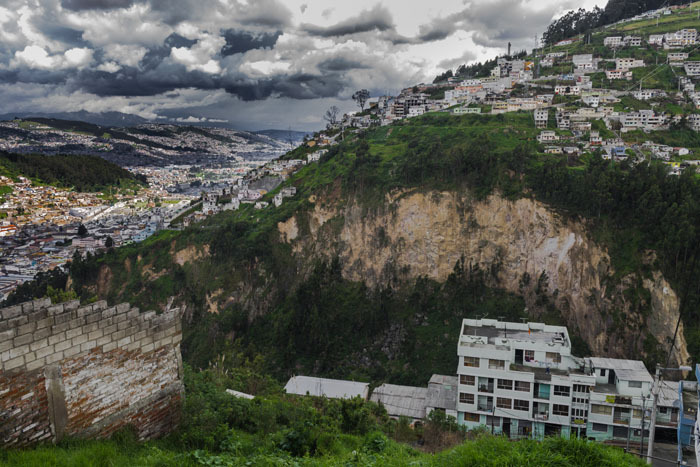 A house overlooking Quito, susecptible to landslides. A young woman looking out over her porch onto the gorge below. A settlement built into the side of the gorge. Naomi Cohen is a reporter fomermly based in Quito, New York, Brussels, and Istanbul. She is currently pursuing a Master's degree in International Security at Sciences Po in Paris.